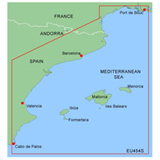 It also includes the detailed information of Islas Baleares.This data card provides best offshore cartography around and works in seamless integration with a wide range of other Garmin products. The BlueChart MEU454S gives faithful representation of published official paper charts . It also provides information of shaded depth contours, intertidal zones, spot soundings, navaids with view range and coverage, port plans, tides, wrecks, restricted areas and anchorages. 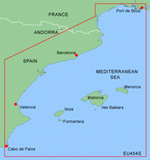 BlueChart MEU454S Features: Barcelona and Valencia Digital Map, Covers Port De Bouc, France to Cabo de Palos, Spain & Islas Baleares, Chart-Specific Information, Object-Oriented Cartography, Faithful Representation of Published Official Paper Charts, Shaded Depth Contours, Intertidal Zones, Spot Soundings, Navaids w/ View Range & Coverage, Port Plans, Tides, Wrecks, Restricted Areas & Anchorages, Trip & Waypoint Management Functions, Models Compatible w/ Data Card Models Compatible w/ Micro SD Card"